Did you answer "e?" You're right. Lake Tahoe, which spans California and Nevada, may be the perfect romantic destination since it offers something for everyone and is one of America's most beautiful spots in every season. Nevada side lodging offers greater services to honeymoon couples. Enjoy the beach in summer and snow-capped mountains in winter? Care to gamble? Want to go horseback riding... mountain biking... canoeing or kayaking? Prefer reasonably priced restaurants? You've come to the right place. 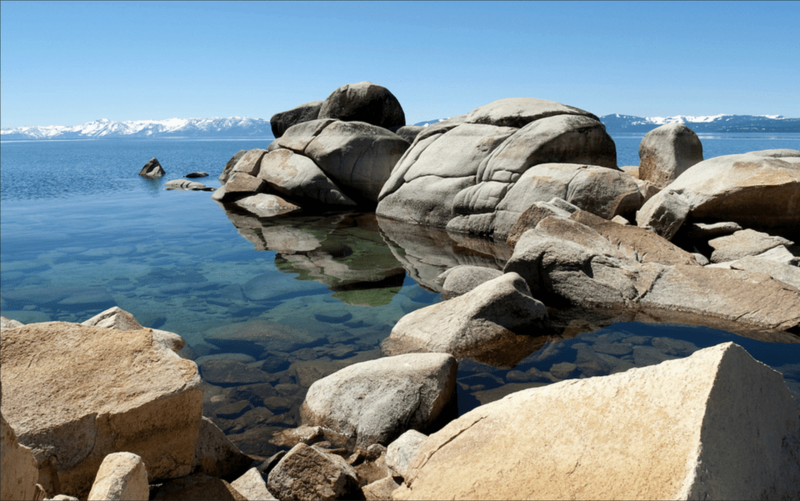 Incredibly clean and pure, Lake Tahoe is the third deepest lake in North America. It measures 22 miles long and 12 miles wide, has 72 miles of shoreline, and is surrounded by a 13,400-acre park. In the summer this splendid body of water attracts boaters, birders, picnickers, and campers. Swimmers and sun-worshipers stretch out on Sand Harbor, a pretty cove with a vista of evergreens and mountains. You can also go kayaking, parasailing, even whitewater rafting. Runners may find companions and news of competitions in Tahoe's Mountain Milers Club. Until it gets too cold for comfort, you can cruise the lake on the M.S. Dixie II paddle wheeler and enjoy a champagne brunch, sunset dinner cruise, or another excursion. Come winter, bring your skis. Heavenly Valley is the largest ski area in the U.S. and affords breath-taking views of the lake way, way, way below. Newbies can book lessons online. Thrill-seekers may get a charge out of extreme skiing and snowboarding here in cold weather... then it's mountain biking, hiking, and wildflower-picking season again. On Lake Tahoe's South Shore (the Nevada side), Harrah's Lake Tahoe Resort & Casino, Montbleu Resort Casino & Spa (formerly Caesars) and Harveys Lake Tahoe are Lake Tahoe's ruling triumvirate of full-service hotel resorts with a casino. Appreciated by couples and bone-weary skiers alike, many rooms at Montbleu have oversize whirlpool tubs. In Lake Tahoe honeymoon couples can gamble around the clock, eat breakfast at any hour, indulge yourselves in posh spa facilities (how about his-and-her massages? ), and be entertained by headliners and elaborate stage productions. All-inclusive package rates are available at some Tahoe hotels, offering double points, free breakfasts and other perks to sweeten the deal. Although TripAdvisor commenters have some harsh words for it, the Hard Rock Hotel & Casino boasts Lake Tahoe's largest outdoor swimming pool and hosts many weddings throughout the year. This 539-room hotel features 20 suites; among them is the "Elvis Suite," where the King himself spent a night back in the 60's. For more options, compare prices on South Lake Tahoe hotels. The top-rated among them is Deerfield Lodge at Heavenly. If ultimate privacy is a must in Lake Tahoe, consider booking a vacation home or condo. Most require a minimum stay of two to five days in busy seasons.